Pakistan 249 (Azhar Ali 78, Misbah-ul-Haq 53, Tendai Chatara 3-64) and 9-419 (Younis Khan 200*, Adnan Akmal 64, Misbah-ul-ul-Haq 52, Prosper Utseya 3-137) beat Zimbabwe 327 (Malcolm Waller 70, Elton Chigumbura 69, Saeed Ajmal 7-95) and 120 (Elton Chigumbura 28, Sikandar Raza 24, Saeed Ajmal 4-23, Abdur Rehman 4-36) by 221 runs. The first innings of Pakistan was squeezed for 249 and their second one was declared at 9-419 after 149.3 overs. Zimbabwe thrashed 327 in the first innings and they were bowled out for 120 mere runs while playing 46.4 overs in the second. Younis Khan (Pakistan) was declared ‘Player of the match’ for his outstanding unbeaten knock of 200 runs in the second innings. The first Test of the two match series concluded on Saturday, September 7, 2013, at Harare Sports Club. Earlier, the hosts started the day at 1-13 in 7.3 overs whereas Vusi Sbanda was at the crease at 5 and his skipper, Hamilton Masakadza, walked in with him to start the proceedings. The later was caught by Azhar Ali off Junaid Khan for just one run in the second over of the day. 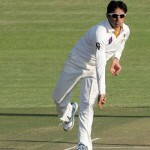 Vusi Sibanda was declared leg before wicket off Junaid Khan for 6 and the Zimbabwe was reeling at 3-19 in 10.2 overs. Sikandar Raza and Malcolm Waller got together in the center but found it hard to score at will. The duo hit one boundary each until the end of the 23rd over as Waller was gone in the next one at 49 after scoring 17 runs. Sikandar Raza followed him nine runs later for 24 off 54 balls with 2 fours when Elton Chigumbura and Richmond Mutumbami tried to force the pace. Chigumbura added nine runs in the 29th over with 1 four and hit another 3 boundaries in the next two overs. They crept to 89 in 33.4 overs when Elton Chigumbura was caught by Mohammad Hafeez at slip off Abdur Rehman for 28 off 35 with 5 fours. The visiting bowlers took charge of the situation after that and the wickets kept on crumbling at regular intervals. Richmond Mutumbami remained unbeaten for 16 off 55 deliveries with 3 fours as the entire Zimbabwean side was sent back to the dressing room for 120 in 46.4 overs. 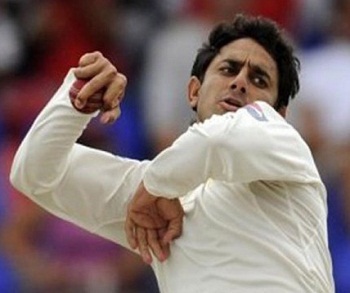 Saeed Ajmal and Abdur Rehman were the highest wicket takers with four wickets each whereas Junaid Khan chipped in with two. 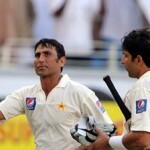 Pakistan triumphed in the first Test with a huge margin of 221 runs and leads the two match series 1-0. The second and final encounter will be held at the same venue from September 10, 2013.